Prescribed application Performa with detail Information can be obtained from the Office of the Medical Superintendent, Civil Hospital, Bahawalpur, free of cost. Certificates /Domicile/CNIC/02-passport size photographs be attached with application. Superintendent, Civil Hospital, Bahawalpur, latest by 27“ April, 2018. Incomplete/received applications after the due date will not be entertained. 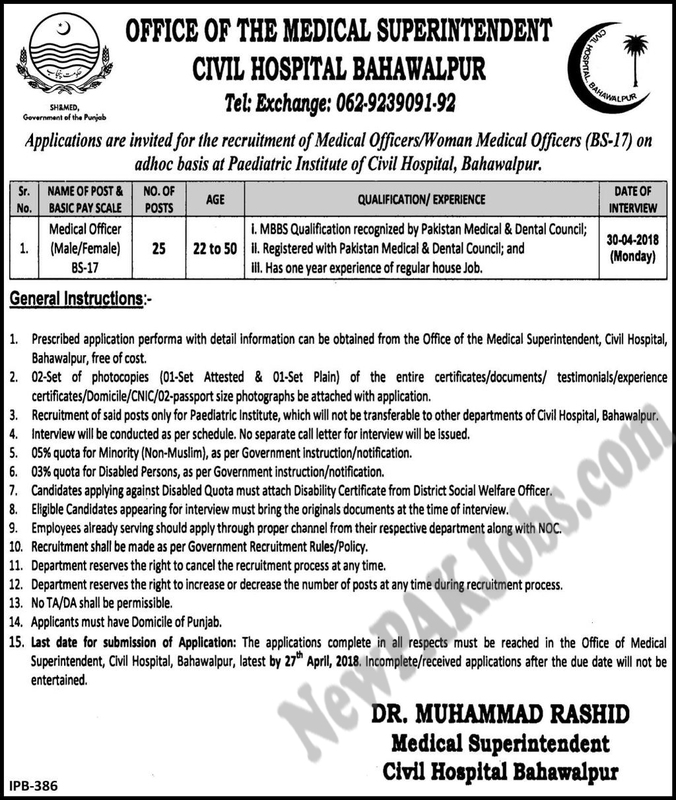 Recruitment of said posts only for Paediatric Institute, which will not be transferable to other departments of Civil Hospital, Bahawalpur. interview will be conducted as per schedule. No separate call letter for Interview will be issued. Candidates applying against Disabled Quota must attach Disability Certificate from District Social Welfare Officer. Eligible Candidates appearing for interview must bring the originals documents at the time of interview. Employees already serving should apply through proper channel from their respective department along with NOC. Recruitment shall be made as per Government Recruitment Rules/Policy. Department reserves the right to cancel the recruitment process at any time. Department reserves the right to increase or decrease the number of posts at any time during recruitment process. No TA/DA shall be permissible. Applicants must have Domicile of Punjab.